I attended ACS (Anglo-Chinese School) in Kindergarten. 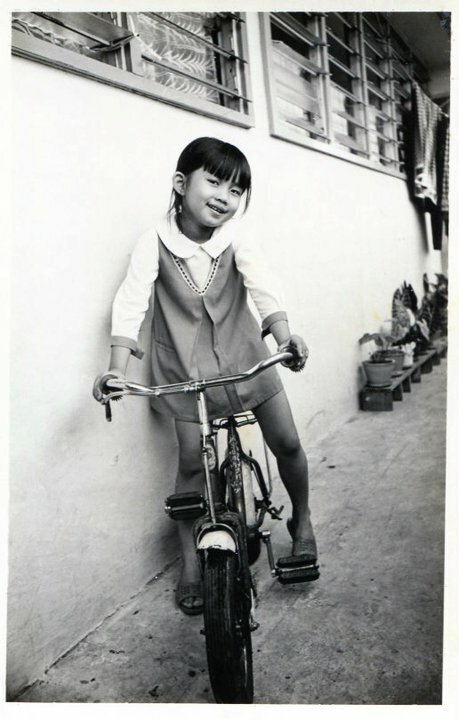 I’d been raised speaking Hakka within the family, and Cantonese among the neighbourhood kids. The teacher spoke Cantonese to me. I remember a boy, Bernard Wong, taking a liking to me and bringing me candy every day. We hung out. Then one day, he started getting obnoxious. I think he’d even been giving me money, and suddenly he wanted it all back. I tried to brush him off but he kept tailing me and getting in my face all day. Every time I tried to walk away, he would follow me. I started walking around the classroom in circles, but he kept tailing me, and when I walked faster, he did too. I finally complained to the teacher and he was told to back off. I still don’t know what his deal was. Then in first grade (Standard 1) I started ‘proper’ school at Convent Primary on Birch Road. We were randomly put into classes, and I was assigned to 1B. Between the time my older sister started school five years prior and when I began, the government had changed the medium of instruction from English to Malay. Not that it mattered to me as I knew neither language going in. Some of my older siblings had attended Chinese-medium schools, but at some point, mom had had the foresight to put the rest of us through English/Malay-medium schools. My textbooks were hand-me-downs from my older sister. There were pages that were ripped out of it, and others that were torn and missing part of the page. Min Foong painstakingly filled out the missing pages of text and pictures with her hand-drawn efforts and taped them into my books. I remember we were given a list of things we needed to bring every day. One of them was colouring pencils. I didn’t have a set; I don’t know if we couldn’t afford it, or if I just never dared ask my dad for it. Every time we had to pull them out to use in class, I had to ask to borrow them from the girl across from me. Unfortunately, not being able to speak English, I struggled for the right words. I remember being confused even as I said, ‘Can you let me your colour pencils?’ – simultaneously thinking there was something wrong with the sentence, and being inclined to say ‘lend’ instead of ‘let’, but not knowing why. Not having consciously come across the word ‘lend’, I didn’t think it existed. There’s a lot to be said for subliminally learning stuff from our new TV, I guess. Then came the tests. I nailed every single one of them. I was scoring 99-100% pretty much across the board. I realised, at 7, after a childhood of living in the shadow of my sisters, that I had a gift. It seemed to me that the wrath of the heavens immediately descended upon me. ‘How dare you call anyone dumb?! You’re going to be the dumb one and you’ll regret it for the rest of your life!’ The verbal tirade went on, it seemed, forever. I couldn’t understand why they were so mad, but it shut me up for good. As I got a little older I realised my older sister pretty much sucked at school, so I took solace in the fact that she’d been mad probably because the truth had hit a bit too close to home. Hi there again. I am not sure if you have heard by now, that your ‘convent’ is no longer there anymore. I was around when it got demolished around 1994. It was not a pretty sight.